Tom, you're right to want to see the NFL's proprietary All 22 footage. The All 22—the game tape that only coaches and players get to watch—is where it's at. Televised games follow the ball and leave the majority of the action unseen. The quarterback makes a throw; a receiver makes a catch, or doesn't. The standard broadcast camera makes their individual plays the center of the show. When something bad happens to them, visibly, the league goes to work on the rulebook. Every once in a while the network will replay a specific battle on the offensive line or in the secondary, but they get to choose which ones. The All 22 is cut from two cameras, one on the 50-yard line and one in the end zone, both high in the rafters, so you can watch whatever battle you want. That's why coaches spend so much time watching film. They're thoroughly evaluating the performance of every player, all 11, on each play, which often means watching each player's performance several times. That means potentially watching each play 20 or 30 times. And that's how you explain to your wife why you won't be home for dinner, ever. If you need a break from your family, get into coaching. The All 22 gives the viewer a much more nuanced perspective of what is happening on the field. You see the reason why the quarterback did what he did, and not just what he did. You see an accurate view of every run play from a fixed point behind or in front of the snap, which reveals the true alignment and gap responsibility of the defensive line and linebackers and the technique of the offensive line. And without the high-definition network cameras and zoomed-in slow-motion shots, the action looks much less personal. It appears as a video game, and we are free to analyze it as such, without those crystal-clear reminders of the game's true brutality, like an up-close view of a head bouncing off the turf. Perhaps the area of the game most compromised by the lack of the All 22 is special teams. 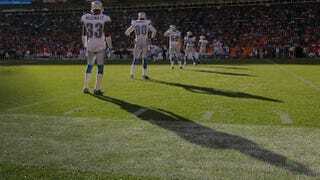 On a special teams play, the television camera follows the flight of the ball and ignores all 22. The reality of special teams remains largely unknown for this reason. No one sees it. The ball is kicked, it flies through the air and a man catches it. Then he is swarmed by a murder of crows, followed by a TV timeout. But the crows have detailed assignments. They're engaged in a choreographed savagery as they cover a kick, or, conversely, attempt to prevent the kick's covering. Special teams coaches come up with all sorts of creative kick returns and punt block schemes: a meeting of the minds overseeing a meeting of the brains. A member of the front line of a kickoff return team has the assignment of blocking a certain player on all the different returns. In order to identify that player, a numbering system was created. The player closest to the sideline on the right, as you face them, is the R1. Next to him is the R2, R3, R4, R5, the kicker, L5, L4, and on down the line. As a member of the return team, I know I am supposed to block the R3 on this return. But it serves me best if I don't look at him. Because as he is lining up for the kick, and as he tears off down the field towards the returner, he's looking around to see who's looking at him. That will usually indicate who's going to block him. So I've learned never to look at him. But that was learned the hard way. My first few years in the league, I stared at him the whole time: before the play and during it. He knew I was going to block him and therefore was free to drop his weight and run right through my face. There was no way around that pain. No matter what, I had to sit down in my stance and take that charge head on. Eventually I learned some nuance. As the ball is kicked, the front-line man turns and sprints back 25 yards, swivel his hips, and sizes up and prepares to block his man. In this case it's the R3. The block must be made with the correct leverage: I must know where the return is headed and not block my man into that lane. Armed with this knowledge, I am free to set up the R3 as I see fit. In this case, since it is a middle return, I will drop back further inside, stacking the pursuit of the R4 and staring at him like I really want to ask him a question. I will not take my eyes from his. Of course, I am really watching the R3 to his immediate left, out of my periphery. But neither of them know it. If they knew it, they'd be ready for it. And the longer I can maintain this lie, the more effective it will be. I stare down the R4 until the last possible moment, the moment the R3 is ready to pass me on my outside. Then, if all is right in the world, I turn and strike him under his chin and send him rolling into his next life. He never saw me coming. Likewise, the R4, who just got ripped, never saw my friend coming because he thought I was going to block him. The eyes deceive. When that technique works, it's a beautiful sight to behold. They fall like human dominoes. Maybe that's why they don't want everyone seeing the All 22. They already had to make rules to protect the few guys that get all the airtime. What if everyone got the airtime? So the magical world of special teams plays will stay where it is now, in dark meeting rooms across the NFL, grown men falling like dominoes while everyone watches another kickoff sail out of the end zone.